Mid Grunter mission Henkie looked at me and said, “how about some bonnies tomorrow?”. Huh? Where? Mossel Bay was where it was at. The bay is absolute glass when it wants to be, and it was this day. The fish? Crazy. So keen they were to eat that reversing into the shoals didn’t even spook them for a second. We lost count. 5 weights and sinking lines. About as much fun as you can have without rum. The ocean was alive and we had shots at Leerfish well over 20kg. Large hammerheads were around and every now and then something the size of a school bus halved the shoal. The man in the grey suit. What a sight. What a day. 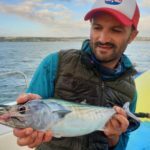 Ah man, those smaller tuna species are such a treat on fly tackle! 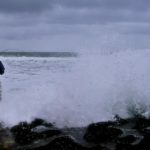 I’ve seen shoals of bonnies getting nailed by yellowfin tuna about 50 m from Robberg – not too far away from Mossel Bay; they were just out of casting range for a fly angler – sooo damn frustrating! Also saw big grey-hound sharks and hammerheads cruising along the the sandy stretches of the headland and two chaps hauled out more than two hands-full of sand steenbras from one of the small beaches (8 m from the side! ); pity I was clueless back then, but I reckon that small stretch of coastline between Mossel Bay and Plett has so much to offer for recreational anglers (including fly fanatics).